Reserve Bank of Zimbabwe (RBZ) governor John Mangudya says he is making sacrifices to keep the country's economy afloat and wants some gratitude from Zimbabweans for his heroics. "Some of us have gone out of our way to get this economy running. It is about time that the people of Zimbabwe are grateful for this sacrifice," the under-fire central bank chief told pre-budget seminar for parliamentarians in Bulawayo on Thursday. He had been subjected to a barrage of hectoring by the MPs over the state of the country's economy and apparent ineffectiveness of his monetary policy interventions. Mangudya took over as RBZ boss in 2014, replacing Gideon Gono who is remembered for printing trillion-dollar bills as the country shocked the world with staggering inflation levels which reached 79,600,000,000% per month by November 2008. Zimbabwe subsequently abandoned its worthless currency in 2009, opting to use instead more stable foreign money with the US dollar the more preferred medium of exchange. 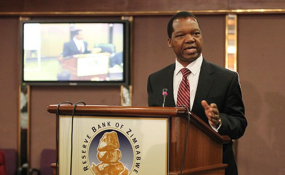 Mangudya however, introduced a surrogate Bond currency in 2014, followed by notes in 2016, vowing to resign if the scheme failed to succeed in ending cash shortages and improving foreign currency inflows. But the RBZ chief has stayed put even as many reckon the Bond Note has spectacularly failed. Again, Zimbabweans struggling to survive over the past two decades have seen little respite from economic hardship since Mangudya took office. Speculation that he might be ousted by President Emmerson Mnangagwa ended after presidential spokesman George Charamba indicated that the RBZ chief was actually set to have a second five-year-term confirmed. And apparently buoyed by that show of confidence by the highest office in the land, Manduya defended his Bond Notes Thursday and rejected blame for the country's economic ruin. "Bond notes are not the issue; the issue is the money in circulation," he said. The problem, according to Mangudya, was the US$10 billion in RTBS bank balances which are not backed by any real money. The electronic balances, he added, were not created by the RBZ. "In that amount (US$10bln), only 4,5 percent are coins and notes, which is your bond notes and coins," he said. "Therefore, if we remove them, they won't resolve the problem. The problem is about the 95,5 percent held as RTGS balances in your accounts. Where is it coming from?" Fiscal deficits (government spending) was also a major challenge, he added. The country could also not expect to generate foreign currency when there was no export productivity. Said the RBZ boss; "What are you producing Zimbabweans? "If you are producing nothing you can't have a higher currency, which is very strong. "Therefore, the challenge that you are facing of foreign currency shortages is because we are not working, and we must start working very hard." Asked by MPs why the apex bank insisted on 1:1 exchange rate between the Bond Note and the US$ when the surrogate currency was collapsing in value on the black market, Mangudya pointed to critical imports. "The reason why we have got 1:1 is because there are essential products that we need to import in this economy to have price stability. Our fuel, which is coming here, and people are buying it using RTGS, EcoCash whatever it is at 1:1. Your electricity today is imported at 1:1."